The Rory book was first launched in 2007. In 2009 a Rory Resource Pack was launched. Following an independent evaluation of this resource in a school setting a new Rory resource pack was developed in early 2013 and now available with either a USB or CD format. The Rory resource is an interactive resource that links to the curriculum for excellence and is supported for use in schools by teachers who have attended training. The original Rory resource pack is more relevant to those working in specialist services and is also available to purchase. 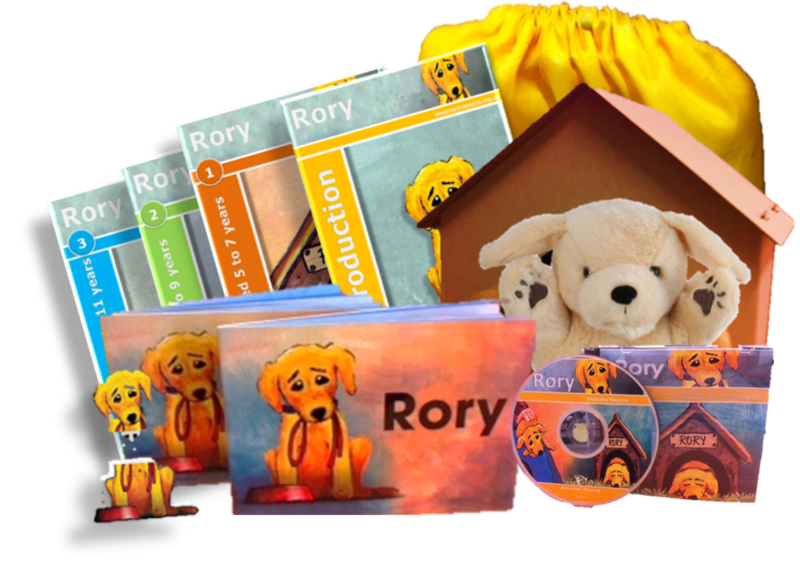 There are also some additional materials that can be purchased separately such as Activity Workbooks and small Rory kennels. TRAINING – Greater Glasgow & Clyde Area. Venue: Eastbank Conference Centre, 22 Academy Street, Shettleston, Glasgow. To book a place please book via CPD system stating: your name, name of school, contact number and preferred date. Free confidential parent support helpline and website. Registered office: 166 Buchanan Street, Glasgow, G1 2LW. Registered in Scotland #SC094096. Head office: 166 Buchanan Street, Glasgow, G1 2LW. Telephone: 0141 572 6700.